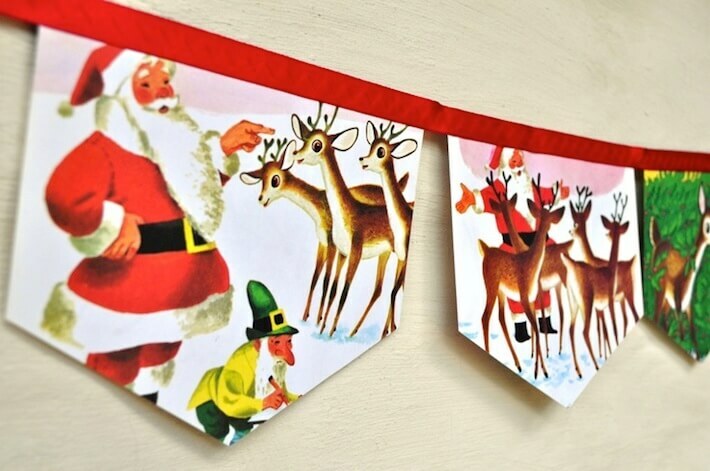 Vintage Santa greeting card banner. source: collectingfeathers, etsy. Our friends at about.com contacted us about some of their simple and budget-friendly DIY holiday decoration ideas so I thought you’d like to have a look-see yourselves. The cool thing about inspiration is that, with a little bit of creativity, you can make an idea your own. For example, if you like the wine cork idea below, but don’t have a votive or any wine corks, use what you do have like leftover ornaments or a collection of toys and place them in a glass bowl or vase. It’s all about the color and bringing a grouping of items together that makes a fun holiday statement. If you want to make a holiday banner but don’t have burlap, upcycle your old Christmas or holiday cards and glue them to a ribbon. Or, use typing paper, cut it into squares, then let your kids go nuts using crayons or markers. Decorating is play…so put on some fun-making-appropriate clothing and enjoy! What budget-friendly decorations do you love to create?